If nothing else, the finale for The Assassination Of Gianni Versace was always going to be interesting. 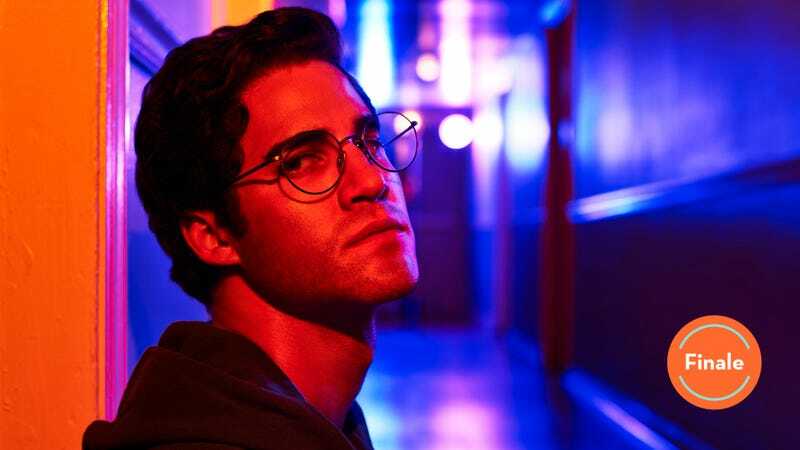 The series started with ambitious goals to provide a true crime series, a character portrait of a killer, a time capsule of the ‘90s, and an overlapping examination of a number of issues ranging from classism to internalized homophobia to the AIDS crisis. Not all of it was successful (in fact, most were not) and it resulted in a fairly uneven season of television where, from episode to episode, it would somehow switch from too packed with information to too shallow. Inability to drum to a steady beat was Assassination’s biggest frustration: the first couple of episodes were almost maniacally paced and brimming with plot; the last few made me wonder why we needed a nine-episode order to tell a possible six-episode story. But seeing how all of this—and the constantly-jumping timeline—would come together, and wondering what’s left in the tank, was part of the intrigue for the back half. After all, all Assassination has left is Andrew’s final kill: himself. “Alone,” almost bookending the premiere episode, returns to July 1997 and again shows us Versace’s murder. But then it shows us the days between the murder and Andrew’s death, speculating on what Andrew was doing, saying, and feeling. Of course, there’s no way for writer Tom Rob Smith (and journalist Maureen Orth) to know the truth. What the episode guesses is that Andrew was celebratory, poppin’ champagne and obsessing over the news coverage, watching the failed manhunt on the deck while looking oddly at peace. He squats on a houseboat (this much is true) and seems thrilled by his face plastered on the screen—until it becomes too much. He watches Lizzie read a letter begging him to give himself up, even bringing up Andrew’s godchildren (this tape is real; we have no way of knowing whether or not Andrew ever saw it), and an interview with David Madson’s father, wondering if the two were lovers. Then Andrew breaks down and calls his father in the Philippines, sobbing on the phone. Modesto is Modesto to the end, basically scolding Andrew because “men don’t cry” but he says he’s going to come to Miami to help. Of course, Modesto isn’t to be trusted. Andrew later watches an interview where Modesto denies Andrew’s homosexuality and, we learn, just wants to make a movie about him. (Here’s a fun fact check: Modesto did indeed want a movie with the non-negotiable title A Name To Be Remembered. He thought John F. Kennedy Jr. could play Andrew, and that it would gross $115 million.) Andrew and Modesto never reunite; shortly after, the houseboat is surrounded and Andrew puts a gun in his own mouth. Maybe that’s part of why “Alone” feels so incomplete (and why I’m hesitant to put the blame entirely on the writing for my lukewarm feelings), because it doesn’t have anywhere to go except back to that fantasy sequence, of Andrew and Versace, all talk of inspiration and lust but not much else. I’ve mostly avoided (I think!) comparing the two seasons but, sorry: American Crime Story had an easier time with The People v. O.J. Simpson in part because it’s an easier story—easier to tell, easier to digest, easier to format into a season-long narrative arc based around a trial. It had an ending where Simpson went free (spoiler alert!) and had a life (and eventually a prison stint) afterward, which writers could use to go back and inform the character(s) and actions (I would be surprised if they didn’t dip into If I Did It as well for some insight). But here, Andrew gave himself a final ending, meaning we’ll never get his side of things, or his reasoning, or closure outside of knowing he can’t kill again. It was an abrupt ending to the “largest failed manhunt in U.S. history,” and that in itself felt incomplete, which is mirrored in the finale. They interrogate Ronnie (oh, hey, Ronnie!) who basically shrugs his way through the police interview—but does confirm Detective Lori’s instincts that they should’ve been looking at particular gay bars, so we can get some bonus anger at the botched investigation. “Alone” reiterates one of Assassination’s most prevalent points: that Andrew, and other gay people, “all imagined what it would be like to be so rich and so powerful that it doesn’t matter that you’re gay” and “the truth is you were disgusted by him long before he became disgusting.” It should feel more powerful than it is but instead it’s a reminder of the show’s insistence on beating us over the head with the same points when it could instead cover new ground. One thing that stuck with me in Orth’s book was the press/celebrity around the matter: Modesto’s Larry King interview, Mary Anne’s general presence on the press circuit, the way that various friends and former lovers of Andrew were paraded around to give their stories, the disgusting hunger of the press who found themselves in bidding wars for sensationalized pictures or interviews, the people who basically had lucrative mini-careers profiting on the many deaths. For much of Assassination, I’d assumed (or hoped) this would get touched on (especially thinking back to the pilot, with the woman’s magazine and Versace’s blood, or the Polaroid photo of his body) but we didn’t get that which certainly seems like a missed opportunity—particularly because the show was heavy on classism, and a general obsession with money and fame. The ending of the series is a mixed bag: Mrs. Miglin finds out Lee was a nice guy who paid bills and helped a man’s career (is the show implying that these were also his lovers? I don’t know! I kind of don’t care! ); Donatella is wracked with guilt because she was annoyed with her brother and didn’t answer his call, the last call he’d make to her before he died; Antonio is all alone without Versace and swallows a handful of pills in a suicide attempt; the series ends on a sweeping shot of a mausoleum where Andrew’s body is kept. And … that’s it. Which is how I felt after that: “Is this it?” But at the same time, I’m not sure what else there could be. Like always, I’m worried that this review makes it seem like I like it way less than I did, but it’s just easier to focus on the parts that left me cold or wanting. Overall, it was a solid season of television with a few bumps in the road, and the ambitiousness of it all helped to sell it. It’s just not a show that I will ever rewatch; I’d be surprised if I’m still thinking about it next week whereas the first season routinely enters my mind. But please, change my mind! Was that end disclaimer in all the aired episodes (I’ve been watching screeners) or just this one? The acting remained superb throughout and I would love it if Judith Light popped up in some future installments— though I must admit I don’t have high hopes for the Katrina season, and wish ACS would just skip ahead to Monica Lewinsky. Speaking of: What’s your dream American Crime Story season? In my opinion, Ryan Murphy’s most missed opportunity was not acquiring Jeffrey Toobin’s Patty Hearst book because that story is basically built for this.